Additional Features and Amenities Come live the good life in the community of Celebrate! With many amenities, resort lifestyle and ease of living, this property is a must see! 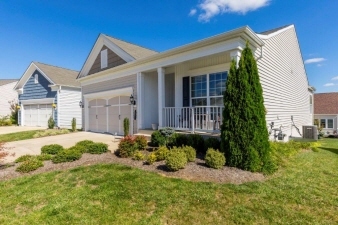 This splendid 3 bedroom, 3 bathroom home offers maintenance free living and is move-in ready. Tidy landscaping and a charming covered front porch makes for a welcoming first impression. Step into the gracious foyer and admire the classic details from the gleaming hardwood flooring to the crown molding and wainscoting. The main hallway opens to an open concept living space which is flooded with sunlight from the wall of windows. This space is an entertainer’s delight with room for seating, dining and cooking. Cooks will delight in the gorgeous kitchen with rich wood cabinetry, gas cooking, bar seating and a pantry. Enjoy a meal outdoors on the deck which offers space for a grill and dining table.